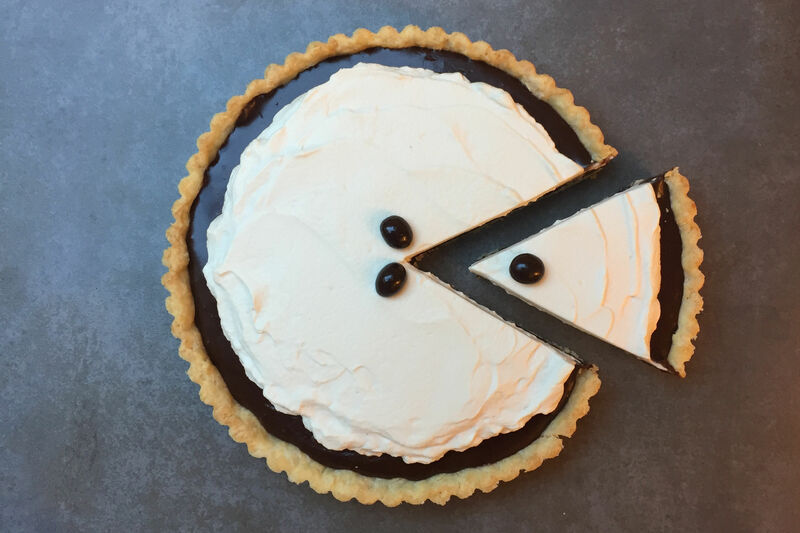 Chocolate Espresso Tart celebrates the perfect marriage of chocolate and coffee. There may be other great flavor combinations out there in the dessert world, but chocolate and coffee together has to be in the top five; no…..in the top three. 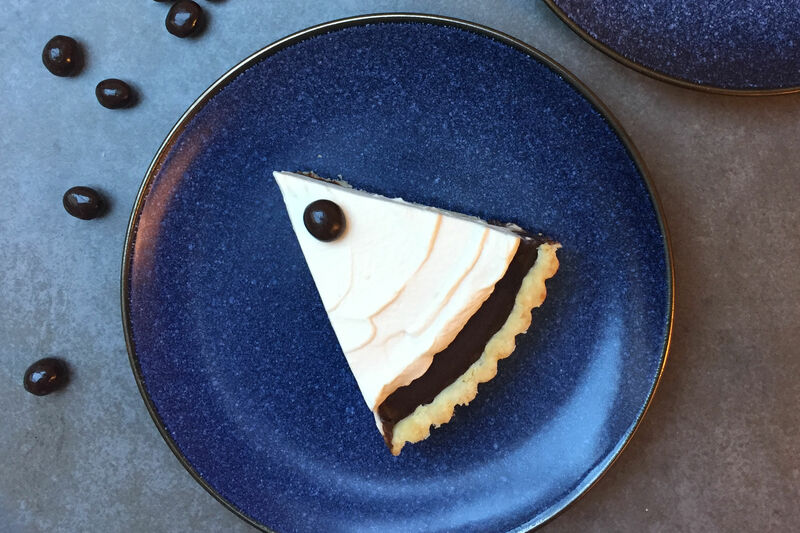 So if you are looking to impress your guests at your next dinner party, you cannot go wrong with this deliciously decadent, swoonworthy Chocolate Espresso Tart. 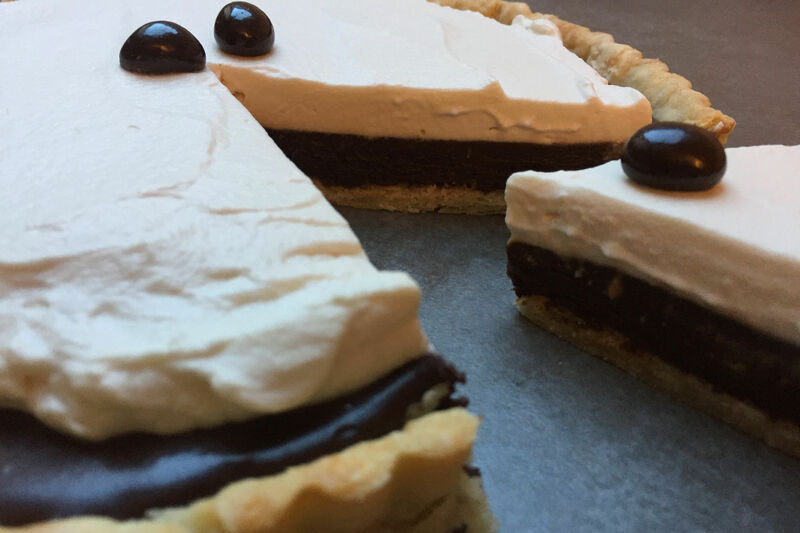 This dessert tart with its rich complex chocolate flavors, looks as impressive as it tastes. It is also surprisingly light. Well, at least lighter than you think it will be. I would say that the chocolate is denser than chocolate pudding but lighter than a chocolate truffle. 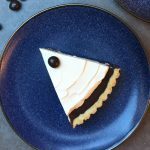 The topping is a coffee infused whipped cream that nicely balances the deep flavors of the chocolate and contributes to the lightness of the tart. I promise you, each bite is pure joy. I will let you know up front that this tart may not be right for a real beginner. It is not because that any specific technique is particularly difficult, but the recipe does require for you to have some baking skills under your belt. Also, there are more than a few steps involved. What I do, is make the tart dough the day before and then continue with the rest of the recipe the next morning. Keep in mind, that the finished tart needs to “set” in the refrigerator for a few hours before you can serve it to your lucky guests. Trust me when I say, it is well worth the wait. Special equipment - 9 inch tart pan with removable bottom. 1¾ cups - all-purpose flour - 8 oz. For the ice water, fill a cup with water, add in an ice cube and put it in the freezer while you measure out the rest of your ingredients. You will only be using some of this ice water. In a food processor with a steel blade, add in the flour, sugar and the salt. Process for about 15 seconds to mix. Cut up the butter and shortening into small 1/2 inch cubes. Add the cubed butter and shortening to the flour mixture and pulse the processor until the butter is about the size of peas. Check after 10 or 12 pulses, then pulse a few more times and check again. Pour the flour mixture into a medium size bowl. Add about 4 tablespoons of ice water and gently mix in with your fingers. Keep adding in more water, a tablespoon or even a teaspoon at a time until clumps of dough start to form and you no longer see dry bits of flour. The dough should be moist and come together when pressed but not wet and sticky. Dump the dough on to a floured counter top and gather into a ball. Take the ball of tart dough and place it on to a piece of plastic wrap. Bring the wrap up around the sides of the dough and over the top to cover the dough. Press down on the ball of dough to make a disc. Round out the sides so it looks like a neat disc of dough. You should see flecks of cold butter in the dough. Refrigerate for 30 minutes. Take out the cold dough and place it on a floured counter top. Roll out the dough with a rolling pin until you have approximately a 14 inch" diameter circle that is about 1/4 inch thick. Start to roll out the dough going about 2/3 back from the edge, then turn the dough a bit and roll again. Keep rolling and turning the dough to form the shape of a circle. Only roll the dough in one direction, never back and forth. Add more flour if the dough starts to stick to the counter. Loosely roll up the pastry dough on to the rolling pin and then gently unroll it on to the tart pan. Press the dough into the bottom of the tart pan and neatly up the sides. Fold more dough into the sides if it appears too thin in some spots. Trim off any excess dough with a knife or roll over the top with the rolling pin to cut off the extra pieces. Cover and refrigerate for 30 minutes. Take the cold tart dough out of the refrigerator and gently press a piece of foil or parchment paper on top. Fill the foil with some pie weights or dried beans. Bake for 10 minutes and then remove from the oven. Take off the foil with the beans and return the tart to the oven and bake for another 10 - 15 minutes or until it is a light golden brown. Let the crust cool on a cooling rack in the tart pan. Set aside. You are pre-baking the tart shell. The tart will not require any more baking. In a medium bowl, with an electric hand mixer, beat the egg, the egg yolk and the sugar until it has doubled in volume and is a pale yellow in color. Set aside. In a double boiler over a low flame, add the chopped chocolate and the butter. Melt until smooth. Whisk in the vanilla and the coffee liquor until well blended. Slowly pour in the egg and sugar mixture into the melted chocolate while whisking. Keep whisking the chocolate while it cooks for about 3 minutes. Remove the pan from the heat and let the chocolate mixture cool. While the chocolate is cooling, in a medium size bowl, whip the whipping cream with the electric mixer until you have soft peaks. Gently fold the whipped cream into the cooled chocolate mixture until it comes together. 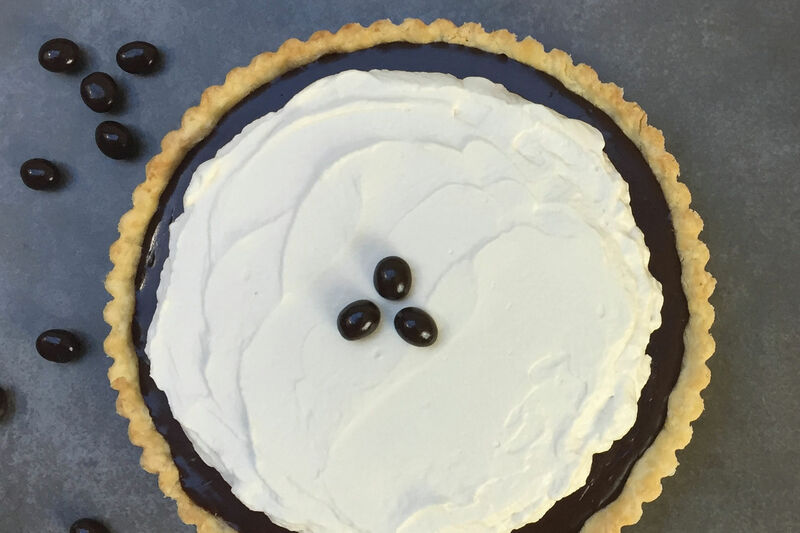 Pour the creamy chocolate into the cooled tart shell. Carefully cover and refrigerate the tart for at least 3 hours to set. When ready, remove tart from the tart pan and place in a serving platter. Prepare the whipped cream topping. Video - How to make whipped cream. With a hand held electric mixer, whip the whipping cream until it starts to thicken. Add the sugar and whip again until soft peaks form, drizzling in the coffee liquor towards the end. Do not over whip. Spread the whipped cream topping over the tart. You could get decorative with a piping bag if you wish. Garnish with chocolate covered espresso beans if desired. If you do not have a food processor, you can use a pastry cutter or two knives to cut in the butter for the dough. Video - How to use a pastry cutter to make pastry dough. You can prepare the dough for the tart crust the day before you plan on making the tart. Keep it wrapped in the plastic wrap overnight. When you're ready, let the dough warm up a bit on the counter top because it probably will be too cold to roll out. If you do not want to use a coffee flavored brandy, you could use cold espresso or double strong coffee. You can either spread the whipped cream on top of the tart right before you serve it, or a few hours beforehand. Keep it refrigerated.